Lost in thought, Inaris climbed the steps to the archives with three books in her hands. The first two were scandalous volumes that had fallen short of expectations, and the third was an introductory to knitting (which, while a valiant attempt, had ended in utter failure). Not watching where she was going she stumbled up the last step that, to her surprise, did not exist, and sniffed indignantly at her clumsiness. Returning the books to the main desk she turned to look around when she caught sight of Dorsett. Completely oblivious to the rest of the room, the man was engrossed in writing down notes and looking at a small stone beside him that emitted a faint light. Inaris’s head listed dramatically to one side as she eyed him. “Returning books and hopin’ to bump into you. What’s that?” she asked, motioning to the stone. Inaris leaned a little as she peered at the stone. “Does the ring give off any light? Perhaps he’s… somewhere where it might give him away, or he has it hidden to be kept safe…” she offered slowly, hoping herself that it was just that. Her expression sobered a bit. “Maybe… maybe he was robbed by brigands in the night and he’s currently hunting them down to get his stuff back?” She tried hard to sound encouraging. Dorsett blinked. “Oh– no– you do not need to. I can keep it.” While unspoken, “Just in case,” hung readily in the air. She smirked. “I think I do,” she countered stubbornly. “I promised Atanamir that I’d keep an eye on you. Either you can surrender the rock to me for the night, or we can have a sleepover and I’ll stay up with the rock while you get some rest.” She almost preferred the latter option, imagining the man might need to be force-fed tea and sat on to keep from fidgeting and pacing all night. Dorsett looked torn, but he eventually picked up the rock and handed it over. “I could just keep it in a cabinet,” he mumbled. Dorsett couldn’t argue with that, so he finally gave up. “Have you convinced Drewett that Elves exist yet?” he asked quietly, shuffling his papers around aimlessly. Inaris arched a brow. “Worth a shot. Would you mind asking her? I admit I’ve never really talked with an Elf before. Not sure how to approach ’em.” Thinking about it, she was sure approaching an orc would be far easier… of course that she had done. Inaris shrugged. “True enough. Maybe I’ll stick to dragons, then and make a game of it.” She almost carried on, suddenly distracted by how absurdly endearing Drewett’s superstitions were, but she cleared her throat and gave her bangs a toss of indifference. Dorsett tucked his papers into his bag, and attempted a slightly wider smile. “Thank you, Jade. I will… see you later, then.” He paused for a moment, and then slipped out. As agreed upon, Inaris strolled through the Ironmonger’s Gate an hour past noon. Slipping her hands into her pockets she glanced behind her towards the little concealed entrance to the hidden garden. An amused smirk curved up her lips at a thought, and she looked back to the lane ahead of her. “You’ve got to! C’mon, there is a nice one outside ‘o town,” said a man’s voice from down a side street. Several other male voices echoed in agreement with the first. Inaris walked on as the conversation to her left lowered into a jumble of grumbled protests and peer-pressure. Hardly a handful of seconds passed before a single set of heavy footfalls sounded behind her. “Think nothing of it. Consider it a little favor.” She extended a hand out to him and they shook, both of their holds lingering. Turning her head up to him she smiled coyly. “They have been hounding me for the past two months of travel. I’ve had about as much as I can take,” Tharnon responded, raising a hand to brush up her forearm. “And what would your lady back home say if she found out?” She stepped closer at his touch and lifted her hands to fix his collar. The streets of Bree always seemed to dirty to Eirikr. Tonight, they stank of the late summer evening and the presence of a growing number of Bree’s paltry residents. Each passing day brought more foreigners to the city; while he felt the anonymity of being a part of an increasing minority population, he also felt each Barding meant an increased chance of discovery. Perhaps it was silly being so paranoid. The chances his father would have recovered from the loss of Sten and so many of his guard so quickly seemed unlikely, but Eirikr never discounted the resourcefulness of the man. 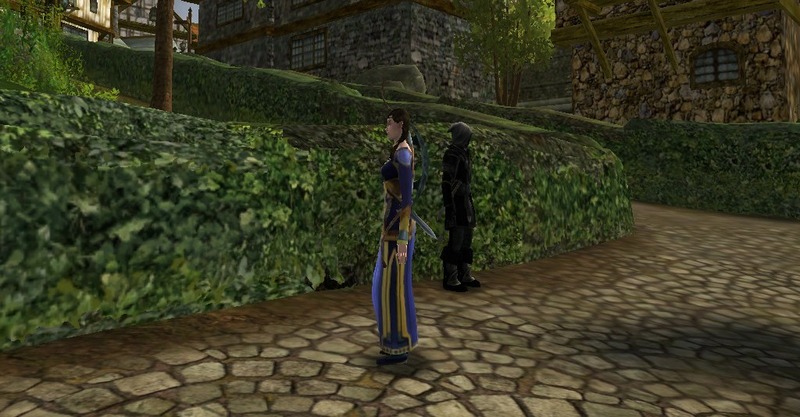 He knew that one day, a shadow of Kolrson Tenorbekk would find his way to Bree and there would be a knife at his back. She needed to get this man to the prison, and fast. Anyatka had made her promise to be careful, and she had, telling her young friend not to worry about her. The scrawny man that was her bounty was the easiest catch she’d had in months. A small twinge of guilt stung her for not telling Anya about her detour, but now she half wished she had gone home to Anya and Eirikr. The door to the Comb and Wattle Inn opened and closed behind her and her stomach sank as the footsteps stopped. Eruviel unclasped the strap over her dagger. “I will not,” she replied coldly, narrowing her eyes at the man. “He is going to the prison where the Justice will sentence him and either lock him away or execute him.” So much for attempting to avoid him for once, she thought grimly. “If I wanted him dead, he would already be dead!” snapped the man, glaring furiously at her. Eruviel raised her chin slightly in defiance, her green eyes blazing. “Like the other men you have killed? You came in here with your dagger already drawn, and have given me no cause to trust you.” I need to get my prisoner out of here, she thought frantically. The masked man sighed. “Take the man then! I will not hurt you . . . .” His voice trailed off, seeming slightly nervous. “The next one is mine,” he spat. Arching a brow at the man, Eruviel took a step back towards the ruffian still laying on the floor. “So you do not wish to question him?” she quipped, smirking. The mysterious man stared at her for the longest time. “Why do you seem to care for the well being of this . . . dog?” he asked, sneering down at the bound man. Eruviel cried out in shock and dropped to the ground next to the man, frantically attempting to stop the bleeding as his spurting blood soaked her gloves. No, no, no, no! Blood and orcs! she cursed as the ruffian’s breathing slowed to a stop. “You could not leave this one man well enough alone?” Her chest heaved with rage as she looked up at the masked man. “I . . . you . . . .” Words failing her, she jumped to her feet and slapped him hard across the face. “No matter what he’s done, he might have had a family; some trapped woman or child depending on him simply staying alive. Did you ever take that into consideration?” she growled, her elvish accent thickening her voice. “I would demand you leave but I’ve already delivered one body to the coroner today. You make a mess, you clean it up,” she spat. Wrenching off her soiled, blood-soaked gloves she threw them against his chest as she stormed past, her eyes hot with moisture. She stopped a few steps past him, clenching her fists. Careless! her mind screamed at her. You knew you could not trust him, yet you let him distract you for one critical second! Warm arms wrapped around her and she froze as she realized the horrid, mysterious man was in front of her, holding her softly. For the love of the Valar, let me be! She squirmed, pushing her fists against his broad chest to get away from him. How dare he touch me! she thought miserably, her core aching. Letting her go, the man walked back to the dead criminal, and knelt, carefully closing the dead man’s eyes. He muttered something under his breath, Eruviel only hearing, “You were there . . . I know it.” Frowning back at the man, her face darkened with a storm of anger and confusion. Glancing regrettably down at her gloves she turned and walked out the door. Her horse stood waiting for her, looking up at her with concern and unease, it’s mouth full of hay. Stepping up into her saddle the man exited the Inn behind her, hefting the body from his shoulder onto his own horse. Mounting the steed he rode up beside her. “I do not do this because I want too. I do this because I have too,” he said matter-of-factly before spurring his horse into a trot down the south road. Eruviel opened her mouth to respond but quickly shut it. Wheeling her steed around she urged the mount into a gallop down the west road leading out of Comb. Her horse turned them towards the homesteads on its own and she did not correct it. You cannot break, she told herself. You have too much to do. Brigands had taken the lives of people she cared about before, and yet she had kept a cool head, not letting even the thought of seeking vengeance take her. Milloth, Cade, and how many others? And now . . . now the thought of this dark man loomed over her like a bad dream. Passing through the gates of the Glaston neighborhood she forced herself to sit upright, her eyes cold and void of the emotions that raged within her. Why . . . why does he kill them? Why does he keep saying he has to? 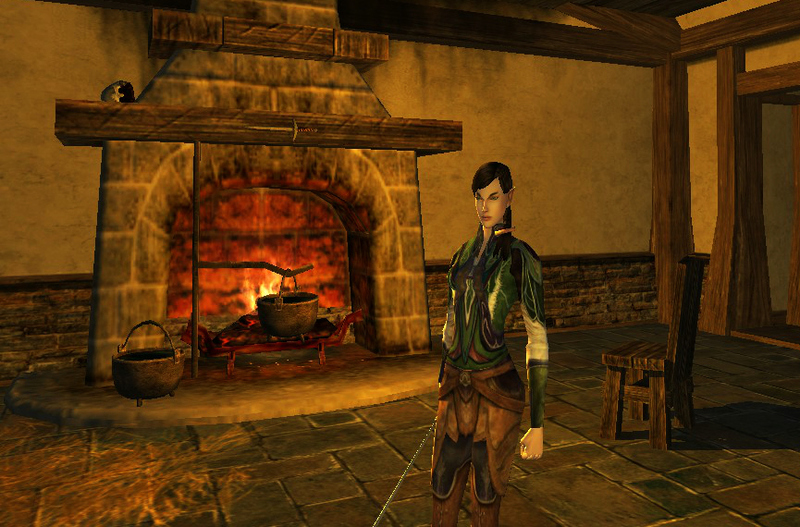 Finally reaching her house, Eruviel quietly dismounted, and removed the horses tack. Going to the well she scrubbed her hands clean of the blood till her skin stung. Silently slipping inside the front door she drew both of the latches to lock the way behind her. A small smile crept across her lips as she saw Eirikr sleeping on his pallet, snoring softly. Peeking her head into Anyatka’s room a small wave of relief washed over her, seeing Anya’s cocooned body softly rise and fall as the woman slept peacefully. Tip-toeing across the main room she closed her bedroom door behind her. Leaning against the door for a moment she wearily pulled her clothes off, not caring to put them away, and wrapped herself in the blanket from her bed. Sliding to the floor in the far corner of her room Eruviel finally took a deep breath, and cried. Stifling a yawn, Eruviel folded her letter, including the solo hunting commissions for her friend. She never remained in town this late into the night and felt ill-at-ease. Slipping her message into the mailbox she noted three shadowed figures, one peering out the southern gate, one pacing inconspicuously down the street, and another crouched behind a bush beyond the stable yard. Turning to head out of town her heart rate began to increase. Could there be another? Before she could set her forwards foot down she heard a whisper of a breath and a soft thud. Turning around she saw the figure that had been hiding beyond the stable yard laying in a dark pool of what could only have been blood. A faint movement caught her eye and she look up in time to see a mask and a dark cloak disappear around the corner into an alley. There is another, she thought grimly. She had heard rumors of murders happening in the night. Heaving a small sigh of frustration, she tugged her gloves on and melded into the darkness as she began to carefully pursue the shadowed figure. Ahead of her the silhouette of what could only have been a man hesitated for a moment before continuing down the corridor. Eruviel steped in time with the man, blending easily into the shadows of the buildings. Rounding the bend in the road she froze. He had disappeared. Impressive, she thought, forcing her pulse to steady. The excitement of a challenge mixed with uncertainty, not knowing if the man had continued on or laid in wait for her amongst the ancient stone ruins. She carefully surveyed the square littered with broken pillars and shattered paving stones. As light as a feather, she carefully made her way through the rubble, stopping just in reach of the light of a street lamp. She smelled the steel and blood. In a flash, as the shadow drew behind her, putting a knife to her throat, she flicked out her dagger, pressing it’s tip against the man’s side. “Following me?” asked a deep voice. “Only because you warrant the effort,” she responded coldly, tapping her blade against his side to make sure he was aware of it. “I hope the blood you already spilled was worth it, or next time you will not see me coming.” Eruviel stepped away smootly, clicking her dagger back into its sheath. “I do not think this is the first time we have met,” said the man, his deep voice growing cold as he laughed quietly to himself. Eruviel smirked as she stepped back out of the lamp-light. “Nor shall it be the last, I wager. Till we meet again, dark one,” she said with a smile.